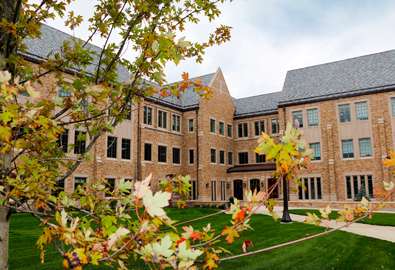 Opened in July 2016, McCourtney Hall is a 220,000 square foot building dedicated to research in the molecular sciences and engineering at the University of Notre Dame. The state-of-the-art building has been designed with collaboration and interdisciplinarity in mind to tackle three key programmatic areas: analytical sciences and engineering, chemical and biomolecular engineering, and drug discovery. The building includes approximately 100,000 square feet of flexible, open laboratory and team space. Standing at four stories (three plus basement), McCourtney Hall’s two wings also include faculty offices, conference rooms, and flex space. Core facilities associated with the programmatic research areas are co-located within the building. 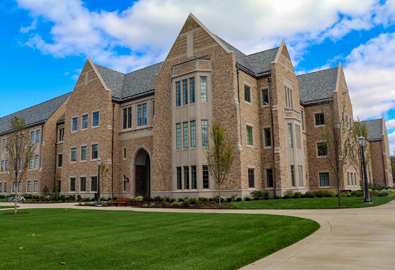 Just east of the Hesburgh Library, it is the first building to be constructed as part of the planned East Campus Research Complex. Located on the third floor of McCourtney Hall, our lab features eight fume hood spaces with adjacent work benches. Instrumentation in the lab includes a MBRAUN glove box, dry solvent system, HPLC, Cryocool, and GC. Outside of the lab, each student has their own work space and shares a communal kitchenette.